For today's pictures we decided to go on this lovely square right in front of the "Kirchgasse" in the "Niederdörfli"! It's probably one of the most amazing places in Zurich - there are never too many people as you can probably tell from the pictures. We're sooo excited for summer to come, 'cause it's just soo much more fun to take all the photos without being so cold that your hands turn red and almost fall off! Also we changed our google+ picture - do you like it? So we hope you all enjoy this post and we will see you very soon! Lovely outfits! I love both of your necklaces and I love that neon bag. That neon bag is very cool ! Love both outfits!! and Satchel bag!! thanks for comment on our blog!! PS: Sorry for our English!! Really like your bag! so colour is so flashy love it! I die for that neon bag! They're super cute with the shorts! unos outfits geniales!!! me encantan!! Guys you are so sweet. Nice looks! I love short! For me it doesen´t really matter when it´s cold for taking photos because I haven´t mostly much time and the complete shooting takes normally only 2 - 5 minutes ... but I agree, in summer it´s more comfy and what what I like on summer, too: the days are much longer, what´s important for me if I need photos in the eventing after my fulltime-job. Girls, if you want to invite me and maybe we can follow? Very nice pics. I like your necklases and bags.Great day. You both look amazing! As usual! You're both adorable. I love those black and white shorts! in love with this short! Oh wow, beautiful outfits and pictures! Great styles! And beautiful images of Niederdörfli. Follow you on GFC now. Great looks! Loving the checkered shorts with yellow accents, and those black jeans with the zippers are the perfect color/fit! 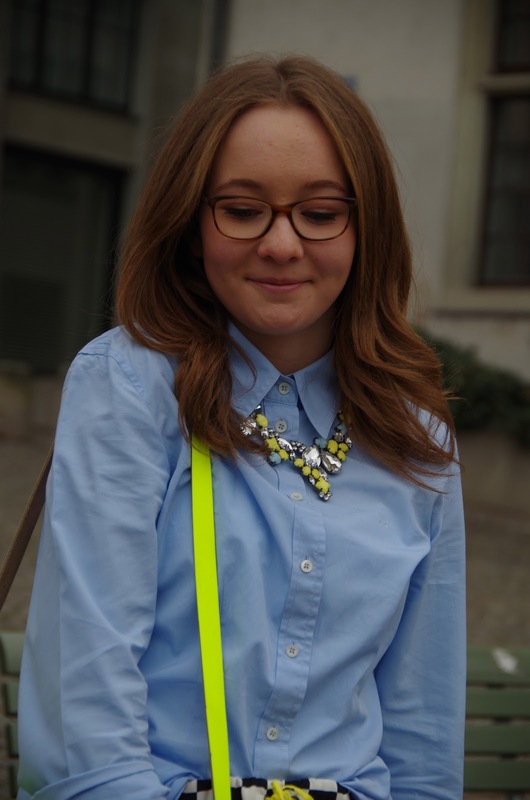 Love the yellow necklace on the blouse! The posts are very cute, love the shorts from zara are beautiful! You're making me wish I was in Zurich! Love the bright colors! Neon trend I love it! Your outfits are so freakishly cute and stunning!! I adore your outfit, it is the best outfit i have seen all day. the neon satchel, chequered shorts and denim shirt. Great outfits! I love the neon yellow! So sweet of you to take time to visit my blog and leave a comment dears. I'm following you guys now. You look fabulous!! love that neon pop! Great post!! Have a great weekend! You guys are looking super cute! Love the neon bag. These are some of the cutest outfits I have seen! 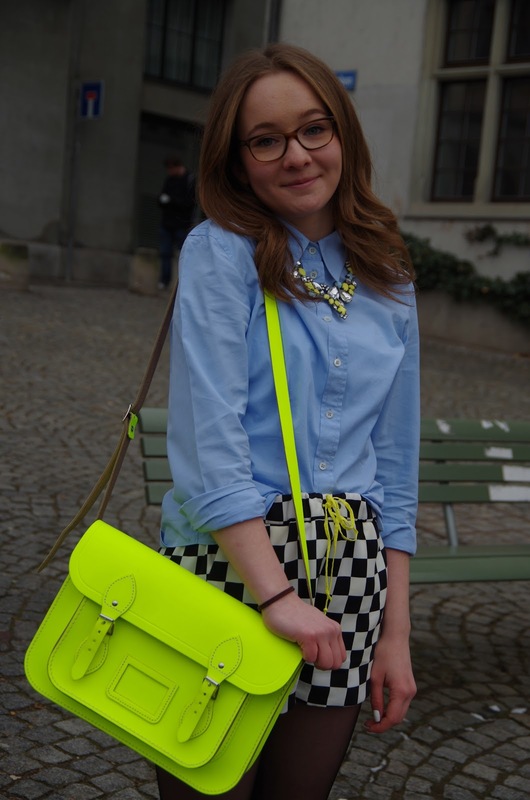 Especially love the neon satchel! Hoping we can follow eachother, let me know! you both look really fabulous! You two look amazing! Love the neon accessories! Looking fabulous girls! I love this look perfection from head to toe!